Both liriope and the related mondo grass with their turflike foliage make excellent evergreen perennial ground covers. Similar in appearance, their culture, needs and use is much the same. They are members of the lily family. Liriope, also known as lily turf or border grass, is hardy from zones 6 to 11. There are two primary species, liriope muscari and liriope spicata. Liriope muscari forms a self-contained clump about one foot tall and wide, and is suitable for edgings and borders. Liriope spicata has slightly smaller foliage and flowers and a creeping, spreading habit more suitable as a groundcover for larger unrestricted areas. Many cultivars have been developed from both which differ somewhat in color and size, some have striped variegated foliage, some are up to 2 feet tall. The plants require no special care and will grow in either shade or full sun in ordinary, well drained garden soil. They prefer moist conditions and a sunny location for best growth and bloom, but are forgiving of drought and neglect by coming back strong once adequate watering resumes. Flowering occurs during the summer months when they produce numerous showy upright flower spikes from 6 to 10 inches tall which are held nicely above the arching foliage. Primary color is a mid-blue, but there are many shades between white and dark blue which can vary widely depending on the variety. There is also a pink flowered form available. After flowering, the spike bears shiny black seeds that resemble small berries. They do not appear to be bothered by insects or disease other than an occasional occurrance of anthracnose which is a fungus, most prevalent in moist conditions. If excessive, or plants appear shaggy, you can shear or mow the plants while still dormant and before new growth appears in spring. Although it is possible to raise plants from seed, the most acceptable method of propagation is by division of established plants. This can be done any time during the growing season. Plants can be set as much as 8 to 12 inches apart (closer if quicker coverage is desired). Water regularly the first two weeks or so, until established. Mondo Grass, also known as monkey grass, is not as widely grown. It is similar to liriope with the same cultural requirements, but has a somewhat more delicate appearance and constitution. 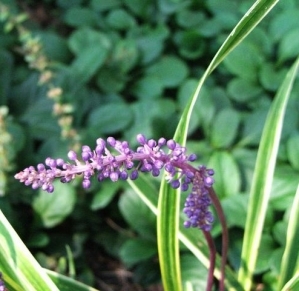 The flower spikes are of paler colors, usually white, pale rose or lilac and are not as boldly noticeable as liriope, being mostly concealed by the foliage. Fruit is not as numerous and the color is bluish - not the dark shiny black of liriope. There is an interesting miniature cultivar that grows only 6 inches tall, commonly known as 'black mondo grass', which has dark purple foliage.